Review by AllTheBestFights.com: 2015-11-15, boring fight between Stefan Struve and Jared Rosholt: it gets one star. Stefan Struve entered this fight with a mma record of 26-7-0 (88% finishing rate) and he is ranked as the No.29 heavyweight in the world. He suffered two consecutive losses between 2013 and 2014, against Mark Hunt (=Struve vs Hunt) and Alistair Overeem (=Overeem vs Struve), but he came back to win in 2015 against Antonio Rodrigo Nogueira (=Nogueira vs Struve). His opponent, Jared Rosholt, has an official record of 13-2-0 (54% finishing rate) and he entered as the No.27 in the same weight class. He lost to Alexey Oleinik last year (=Rosholt vs Oleinik) but then he has won over Josh Copeland and Timothy Johnson (=Rosholt vs Johnson). Struve vs Rosholt is on the undercard of Ronda Rousey vs Holly Holm – UFC 193. Watch the video and rate this fight! Review by AllTheBestFights.com: 2015-11-15, epic fight with some tough exchanges and a spectacular finish: Ronda Rousey vs Holly Holm is one of the best mma fights of the year 2015 and it gets four stars (UFC Fight of the Night and UFC Performance of the Night). Both undefeated, the black belt in judo and former Strikeforce Bw champion Ronda Rousey entered this fight with a perfect mma record of 12-0-0 (100% finishing rate) and she is ranked as the No.1 women’s bantamweight in the world while her opponent, the former Wbc, Wba, Wbf and Iba boxing champion Holly Holm, has an official record of 9-0-0 (67% ko/tko victory rate – she has never won via submission) and she entered as the No.8 in the same weight class. Both fighters have already fought twice in 2015: ‘Rowdy’ Rousey has beat Cat Zingano (4-stars-fight, Rousey vs Zingano) and Bethe Correia (=Rousey vs Correia) while Holm has won over Raquel Pennington (=Holm vs Pennington) and Marion Reneau (=Holm vs Reneau). 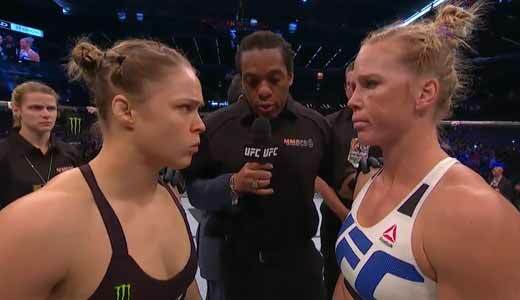 Rousey vs Holm, main event of Ufc 193, is valid for the Ufc women’s bantamweight title (held by Rousey). Watch the video and rate this fight! Review by AllTheBestFights.com: 2015-11-15, fight not particularly exciting between Joanna Jedrzejczyk and Valerie Letourneau: it gets two stars. The undefeated Joanna Jedrzejczyk entered this fight with a perfect record of 10-0-0 (50% finishing rate) and she is ranked as the No.1 women’s strawweight in the world. She has fought twice in 2015 winning the Ufc Sw belt against Carla Esparza (=Esparza vs Jedrzejczyk) and defending it once with Jessica Penne (=Jedrzejczyk vs Penne). Her opponent, Valerie Letourneau, has a mma record of 8-3-0 (63% finishing rate) and she entered as the No.7 in the same weight class. She suffered her last loss in 2012 when she faced Claudia Gadelha (via split decision), since then she has won four consecutive bouts beating Maryna Moroz in his last fight (=Moroz vs Letourneau). Jedrzejczyk vs Letourneau is valid for the Ufc women’s strawweight title (Jedrzejczyk’s second defense); undercard of Ronda Rousey vs Holly Holm – UFC 193. Watch the video and rate this fight! Review by AllTheBestFights.com: 2015-11-15, some good single shots but it is not enough to get three stars: Mark Hunt vs Antonio Silva 2 gets two. The 2001 K-1 WGP champion Mark Hunt entered this fight with a professional mma record of 10-10-1 (70% ko/tko victory rate – he has never won via submission) and he is ranked as the No.9 heavyweight in the world (currently the #1 in this division is Fabricio Werdum) while his opponent, the black belt in karate, judo and Bjj Antonio ‘Bigfoot’ Silva, has an official record of 19-7-1 (89% finishing rate) and he entered as the No.11 in the same weight class. 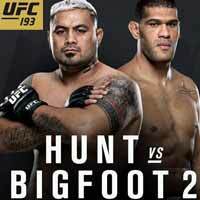 Both fighters have won just one out of their last five bouts: Hunt beat Roy Nelson in 2014 (=Hunt vs Nelson) but then he lost to Fabricio Werdum (=Werdum vs Hunt) and Stipe Miocic (=Hunt vs Miocic) while ‘Bigfoot’ Silva came back to win in his last bout, against Soa Palelei in August 2015 (=Silva vs Palelei) but he had lost to Frank Mir in February (=Silva vs Mir). The first fight between Hunt and ‘Pezao’ Silva ended in a draw but it was one of the best mma fights of 2013 (=Silva vs Hunt I); this second fight is on the undercard of Ronda Rousey vs Holly Holm – UFC 193. Watch the video and rate this fight! Review by AllTheBestFights.com: 2015-11-15, pretty good fight between Uriah Hall and Robert Whittaker: it gets three stars. The black belt in karate Uriah Hall entered this fight with a pro mma record of 12-5-0 (83% finishing rate) and he is ranked as the No.7 middleweight in the world (currently the #1 in this division is Chris Weidman). 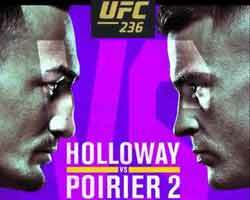 He lost to Rafael Natal in May, but then he has won over Oluwale Bamgbose and Gegard Mousasi (=Mousasi vs Hall). His opponent, the black belt in hapkido and karate and Tuf “The Smashes” Ww winner Robert Whittaker, has a record of 14-4-0 (86% finishing rate) and he entered as the No.18 in the same weight class. He suffered two consecutive defeats between 2013 and 2014, against Court McGee (=McGee vs Whittaker) and Stephen Thompson (=Whittaker vs Thompson), but then he has won three fights beating Brad Tavares in his last one (=Tavares vs Whittaker). Hall vs Whittaker is on the undercard of Ronda Rousey vs Holly Holm – UFC 193. Watch the video and rate this fight!